Day 25 – I am thankful for the internet, which has connected me to so many new friends that I hope to meet for real. Thank you for sharing your lives and thoughts. Day 26 – I am thankful that I live somewhere with seasons. I may not always enjoy the weather, but I do like having 4 seasons. Maybe just not all in one day. Day 27 – I am thankful for my ancestors who passed on my love of working with fiber, even though I never met them. Day 29 – I am thankful that I am comfortable in my own company. I know too many women who think they are whole only when they have a man in their life and settle for less than they deserve. Day 30 – I am thankful that I have so much to be thankful for! The last 4 1/2 years have been hard, I won’t kid anyone about that. I have lost so many special people and my job. Money is really tight. At the same time, I have so much to be thankful for. If we would all focus on the blessings in our lives instead of the negatives, we would all be so much happier. I am sharing the picture of the bride from Montana with her shawl. She shared the picture of her and me on Facebook, so her she is in all her glory. She was Daughter’s roommate all through college and after, and very, very shawl-worthy. I am just so glad that it matched her dress so well (almost looks like I had seen the dress before hand and planned things. Nope, just lucky). Unfortunately, I do have to report that NaNo was a fail this year. I got to just over 17,000 words. I just couldn’t get anywhere with my story. I will keep plugging away at it, because I do think there is a story there, but it did not want to cooperate with the NaNo timeline. Oh well, next year. I would encourage anyone thinking about it to take part. It is a very interesting self-challenge, and it continues to amaze me how much more creative I am in general during November when I am trying to put those 50,000 words done. On the knitting front, I am still working on the uber:secret Christmas knitting, so no pictures of that. I just bought the latest issue of Interweave Knits, specifically for an article on knitting infinite cables. I would love to be able to knit a vest with my celtic knot ram. I may start with something easier, like this tree of life. It has been a very busy week. My daughter had started the tradition of “Friends Thanksgiving” with her friends back in middle school, and introduced it to her college friends. They still continue to do it; this year was #6. Since she is gone, I am invited (only parent who is). It was set for November 17th this year, and I made plans to go. The night before I’m leaving, my check engine light came on. Boo! This is about 800 miles round trip, and I don’t want to do it in a rig that might die at any moment. Luckily, my niece works for a car rental company, and she was able to get me a great deal on a rental car (which my mom ended up treating me to!). So Friday afternoon, I headed over the mountains to Eugene, because Kid the Younger and his fiancée were coming with. It was a nice evening. Kid and I went to see the new James Bond movie. We got lost on the way to the theater, but had a nice conversation along the way. This is the first year that he will not be able to be home for either Thanksgiving or Christmas, and I will miss him. It’s nice to know that he will miss me too! Saturday dawned rainy. I totaled a car when I was pregnant with Kid the Elder, and have been uncomfortable driving in the rain ever since. Oh well, can’t be helped. Off we went. It ended up raining all day (and the next, and the next…) The party was wonderful. It has evolved, as traditions should. The first baby was brought, and several dogs were also in attendance. We always go around the room and say what we are thankful for. Most of them are very heart-felt, but some were just flat-out funny (one young man was thankful for indoor plumbing). These young people are the most gracious, beautiful souls, and I truly feel blessed that they continue to stay in touch with me and include me in their lives. They credit my daughter with teaching them that friendships are worth the work to maintain. On Sunday, we left Tacoma and went to visit a couple of my sheep friends. One has recently had a cancer diagnosis, and when I let her know I was going to be in the area she expressed an interest in me coming by. It was a wonderful visit, then we were on the road again, back to Eugene, still driving in the rain. I spent the night with the kids again, rather than drive back over the mountains in a strange car in the dark. Luckily, all that rain had not translated into snow on the mountains. It was a wet drive home Monday, but uneventful. I connected with Laura, and we made arrangements for her to come over that afternoon to pick up my turkeys for the drive to the butchers on Tuesday. I got them penned up in a small area outside their pen when I got home. When Laura came, we got my coolers into the truck, then I handed hens over the fence and she put them in the truck. There was no way I was lifting the two toms that high, so we let them out of the pen and walked them over, then we each lifted one. The weather for Tuesday was supposed to be wet, snow level at 5,500 feet. Laura got to my place at about 7:30, and off we went. As we’re headed down my road, she informs me that her windshield wipers have an issue, so they don’t work when it’s wet. Oops! We have an appointment to keep, so staying home really isn’t an option. 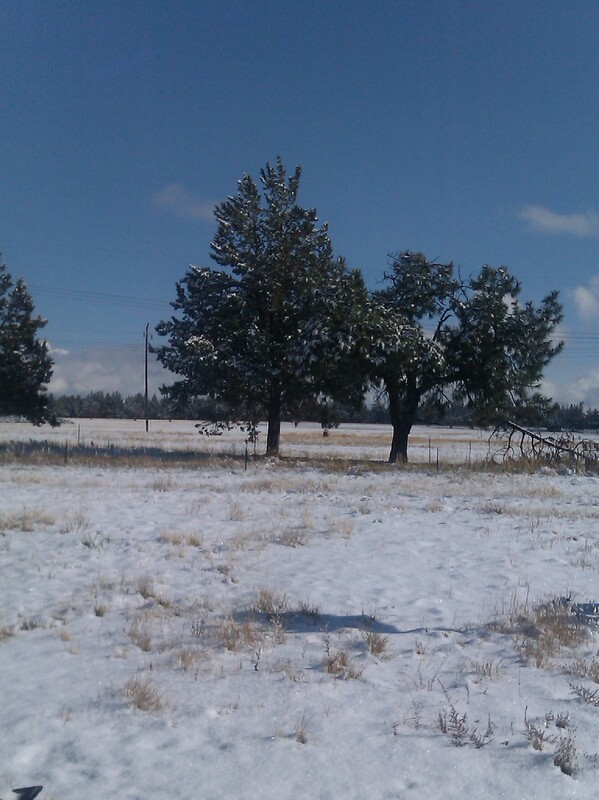 It turned out that the weatherman misjudged the snow level by about 2,000 feet. It is snowing big, fat, wet flakes before we hit the pass. We stopped just the other side to use the ice scraper to clean off the windshield, and Laura opened her window several times to clean off the corner so the built up snow could slide off while we were driving until we got down far enough that it turned back into rain. Several people passed us laughing and pointing when they saw the turkeys, which were visible when they stood up in the back of the truck. We got to the butcher’s a bit early, causing a bit of a panic on their part, since they were running a bit behind (first appointment of the day was a half hour late, putting everyone behind). We sat in the office, knitting and chatting with our friend who was nice enough to bring us ice for the coolers. We talked about everything under the sun, much to the amusement of the other customers. When they were ready for us, Laura went out and handed birds out one at a time. They managed to process our 20 birds in just under 2 hours! My seven ended up being much bigger than anticipated. Smallest one was almost 17 1/2 pounds, and the 2 toms were almost 33 and 41 pounds! Yikes, that’s a lot of turkey! I had made arrangements to meet my future in-law in Salem to get her bird, so we made a quick stop for that before heading back over the mountains again. The addition of headlights to the mix made the drive back to our side of the world even more challenging. Laura said she was very proud of me for not squeaking once during the trip. I shopped on Wednesday for the big day, and brined the smaller tom. Thanksgiving was at my mom’s. My friend Brenda came with her folks, and Laura joined us with a fantastic cranberry salsa. I had to make a couple of changes to the menu, since Laura is allergic to mushrooms, and Brenda’s mom is allergic to dairy proteins. Nothing major that ruined the meal. I made my usual stuffing without the mushrooms, and I made a rice stuffing for the first time by combining two recipes I found online (recipes are just suggestions, right? ), and did a 7-grain roll that usually calls for butter (substituted shortening). Nobody went away hungry, and I still had half a turkey to deal with. I do love home raised turkey. Even as big as he was, he was still tender and very moist. And he cooked way faster than I anticipated. I have since boned him out, and the carcass is simmering away on the stove in a gigantic stock pot. It is too big to fit on my biggest burner. 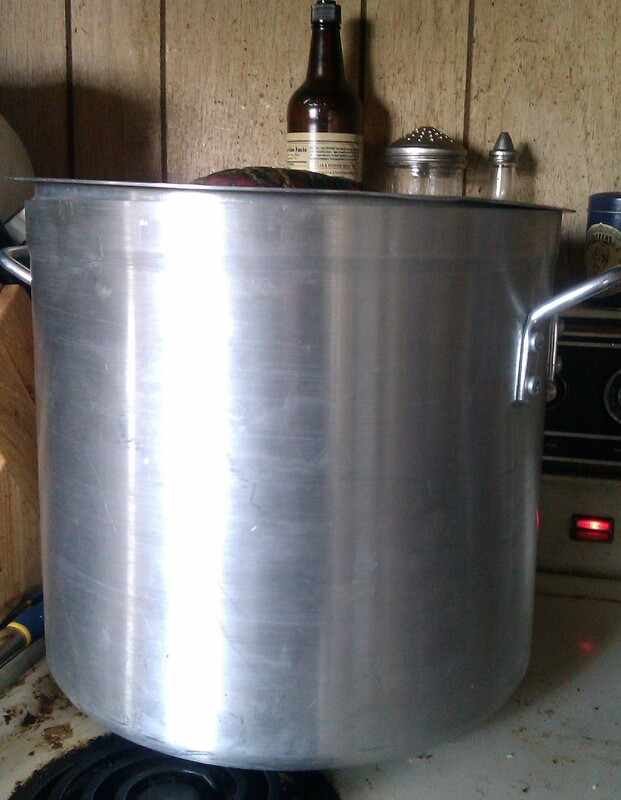 There is no room in my freezer or mom’s (which has 3 turkeys in it), so I will be canning stock when it is done brewing. I am squeezing in some knitting these days, but most of it is surprise stuff, so no pics until after they have reached their recipients. Good stuff, I promise. I am being good about continuing my “30 Days of Thankfulness” posts on Facebook, so here are the latest installments. Day 11 – I am thankful for the men and women of our military, whose sacrifices have helped make this country what it is. Day 12 – I am thankful that my dad took the time to teach me to be handy. It is a good thing to be able to fix things. Day 13 – I am thankful for my sistahs. Day 14 – I am thankful for my creative skills, even when they distract me from getting things done. Day 15 – I am thankful that I was able to live abroad as a child. It taught me so much about getting along with people I thought I had nothing in common with, and showed me that we are all connected. Day 16 – I am thankful that my adult children actually like spending time with me. They are pretty amazing people! Day 17 – I am thankful that my daughter’s friends continue to share their lives with me. They are some of the most beautiful people in the world, and I am blessed by having them in my life. Day 18 – I am thankful that I live in a country that is inching towards allowing all of its citizens to marry the person they love. Day 19 – I am thankful for modern conveniences (electricity, medicine, & transportation, to name just a few). Day 21 – I am thankful for my mom. Day 22 – I am thankful for the wonderful people sharing Thanksgiving with me today. Day 23 – I am thankful that Facebook has given me the opportunity to reconnect with family. Some of my relatives are pretty awesome folks! Day 24 – I am thankful for the joy that music brings to my life. Love listening to my kids sing. Day 1 – I am thankful that my Daughter still comes to visit me in my dreams on a regular basis. Day 2 – I am thankful that, despite set backs and challenges, I am still able to have my little piece of land and my beasties. Day 4 – I am thankful for my depression, for it makes me appreciate the good days so much more. Day 6 – I am thankful that I live in a country where political discourse is possible and I am free to vote for the candidates of my choice without fear. Day 7 – I am thankful that, while I am not rich in money, I am wealthy beyond belief in the things that truly matter – friends, family, health, and spiritual peace of mind. Day 8 – I am thankful for my aches and pains, which remind me that I am still alive. Day 9 – I am thankful for the beauty that greets me every day when I look around. Day 10 – I am thankful for the animals that share my life, and for the things they have taught me and given me. More to come as the month progresses. It also reminded me that one year, when the kids were little, I cut out a bunch of construction paper leaves, and we all wrote on them most days. On Thanksgiving day, I spread the leaves on the table, and we took turns reading them through dinner. It was an interesting exercise, especially to learn the things that my children were thankful for. I wish I could say we made it a yearly tradition, but we didn’t. I still have those leaves tucked away somewhere. I should dig them out. NaNoWriMo continues, but not as easily as last year’s effort. I started with the first line of Stephen King’s “The Gunslinger” (book 1 of the Dark Tower series). Mine is a very different story from his, but it is not flowing well at this point. I am about 7,000 words behind where I should be, and I am tending to ramble, filling in words that have nothing really to do with the story. But I think I can still do it (feeling like the Little Engine at this point, “I think I can, I think I can”). My character really isn’t taking charge like the woman I was writing about last year, and he seems to be perfectly happy leaving me in charge. She was not! I had ideas about what I wanted to write, and she would take over and tell me what she wanted to do instead. I still have no idea where he’s going, and I’m 9,000 words in. The weather has finally decided to be winter. Tuesday it was over 70 degrees. I drove down to drop off my ballot with my window open. This morning, I woke to this: I am really glad I filled all the waterers yesterday when I fed, and that I brought in extra wood for the stove. It is pretty to look at, but I have to go over the mountains twice in the next 10 days. I don’t worry about my driving, it’s the rest of those idiots on the road that think that just because they have 4 wheel drive they can drive like crazy people. Next Friday I head to Kid the Younger’s and on Saturday we will head up to Tacoma for “Friend’s Thanksgiving”, a tradition started by Daughter in middle school and transferred to her college friends. I love that they still carry it on, and that they include me in it. 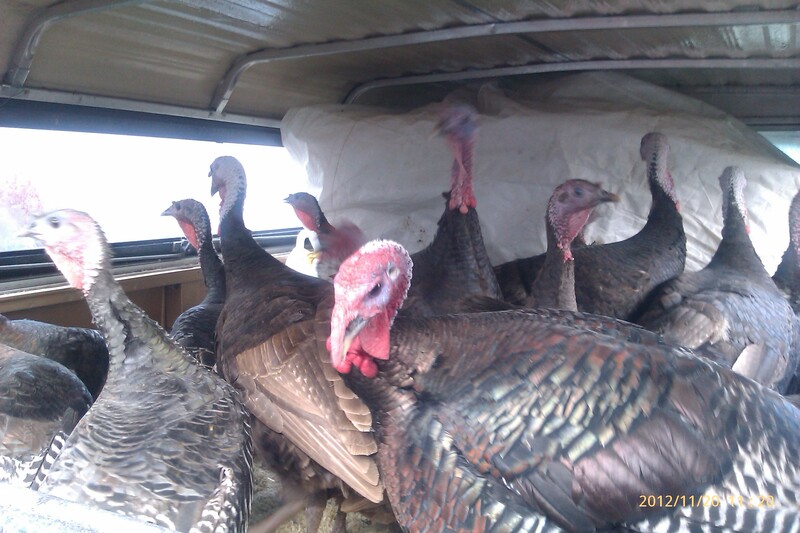 Then right after I get back from that, it will be time to take the turkeys to the butcher. Laura and I are making a road trip of it. She is letting me piggyback on her butcher date, since they are booked solid this time of year. We will both make appointments for next year while we are there. It is a different place than I used last year. She has used them in the past and has been very happy. Instead of dropping the birds off in cages by 7:30 am like I had to last year, we don’t have to be there until 12 (much more manageable, given the distance to drive), and they will process our birds only until they are done. It means fresh turkey for Thanksgiving, not frozen! It also means I need to figure out how many birds I want to raise next year, so that I can give the butcher a number when I make my appointment for next year. Off to figure that out!